As an artist, I can get carried away with creating new pieces. This completely happened with raw ruby. Each month, I try to create a single piece or two for the next month’s birthstone. Typically quick and relatively fun, I got a whammy with July’s birthstone. It wasn’t an issue of difficulty. The pieces just kept coming…and coming… and coming. It all started with a gem show- the Toronto Gem and Mineral Expo to be exact. To let a crystal jewelry designer into this show is equivalent of leaving a 5 year old in a candy store with $100- just don’t do it. As you an imagine, I went in focused to spend only 1.5 hours and left 3+ hours later. One of my amazing finds at this show was two types of raw ruby. One dark and manly, the other bright and feminine, they were a combo sent from crystal lover heaven. I couldn’t help but purchase enough of both so that I could create a line with these lovlies. And so it happened. Five pieces later, and over twenty hour easy, I created a raw ruby line. It focused on differentiating the bright from the earthy, the feminine from the masculine vibed stones. For the female pieces, all ruby pieces used 0.925 sterling silver as their primary metal. 14k gold and 14k rose gold accent the designs. I used rose gold for the pinker rubies and normal gold for the redder. No styles go past larger that 1.5″ tall and the smaller was 8 mm – teeny tiny! As minimalist and delicate styles are in, I felt that I should follow the fashion trend. For the men’s piece, I stayed with the dark and earthy. The purple red tumbled raw ruby was 50 carats, aka large. I used antique bronze wire to increase its darker tones and to ground the piece. 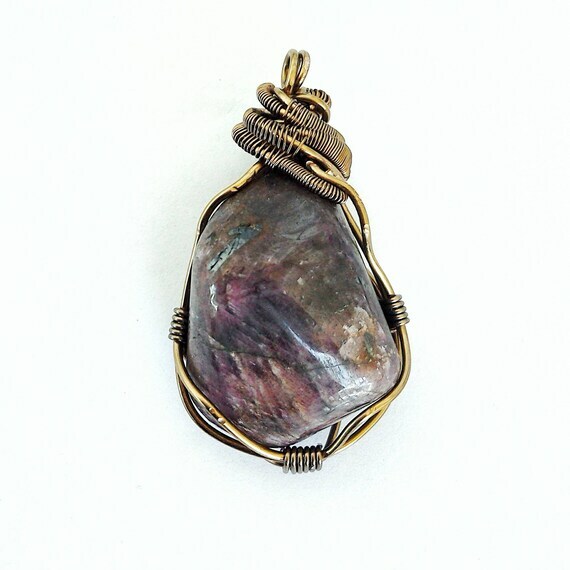 I focused the detailed wire wrapping at the top of the pendant as it lets the stone’s shape take front stage. (This is common in many of my male necklace styles- stones first, detail second.) The finished product is a large men’s talisman that can be worn confidently by any guy. Now, what made this line different from my other birthstone lines? The fact I did it in a week! If you are into crystal meanings, ruby is the stone of energy, vitalization, and kundalini power. All I can say is that beautiful energy- the type that makes you go without hesitation- flowed through me. My hands took over, my mind went a bit on pause, and then it was done. A great way to create a new precious ruby line, no? If you would like to see the entire ruby collection, click here to visit my Etsy store.